Crochet "life" in the form of coral reef art evolves just as real reefs do. Last week, Sophia Roosth, a historian and anthropologist of biology at Harvard University, gave a talk at Louisiana State University on an ethnographic study she has conducted with the creators of the Crochet Reef Project. 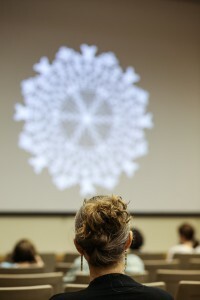 Roosth's talk was a fascinating exposition of how collaborative science art projects like the Hyperbolic Crochet Reef adopt underlying principles of math, biology and natural selection while themselves evolving and developing emergent properties. Just as deep-sea creatures evolve and take on new forms dependent on their environments and the ecosystems in which they belong, so collaborative science art projects evolve and diversify. The Crochet Coral Reef is a "woolly celebration of the intersection of higher geometry and feminine handicraft," created and curated by Christine Wertheim and Margaret Wertheim. The Crochet Reef is also a collaborative project, with pieces of the reef created by students and craft groups around the world. The Crochet Coral Reef relies fundamentally on an approach to crochet that imitates hyperbolic geometries. Hyperbolic geometries abound in the natural world. Hyperbolic forms are nature's way of maximizing surface area to volume. For filter feeding marine organisms like those that create the Great Barrier Reef, this surface-area-maximizing geometry is particularly suitable. Hyperbolic forms in marine organisms. Slide by Sophia Roosth. Photo by Paige B. Jarreau. Hyperbolic crochet. Slide by Sophia Roosth. Photo by Paige B. Jarreau. The Hyperbolic Crochet Reef Project is fundamentally about raising awareness of climate and ocean changes that endanger coral reefs around the world. From teaching students about hyperbolic geometries to bringing crafters together around an environmental issue, the project has received significant attention as a hands-on science communication project. As quoted in a Smithsonian.com article on the project published in 2010, Wertheim says, "A reef is made up of billions of coral polyps. Each one of these is completely insignificant individually, but collectively, they make up something as magnificent as the Great Barrier Reef. We humans, when we work together, can do amazing things." 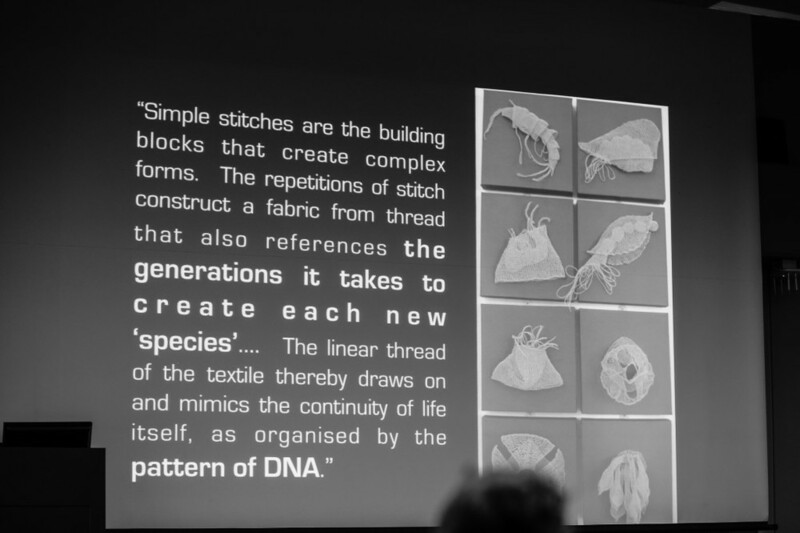 But how does a ball of yarn turn into a living structure that doesn't just imitate real-world marine organisms but develops its own emergent morphologies, based upon natural selection and human collaboration? 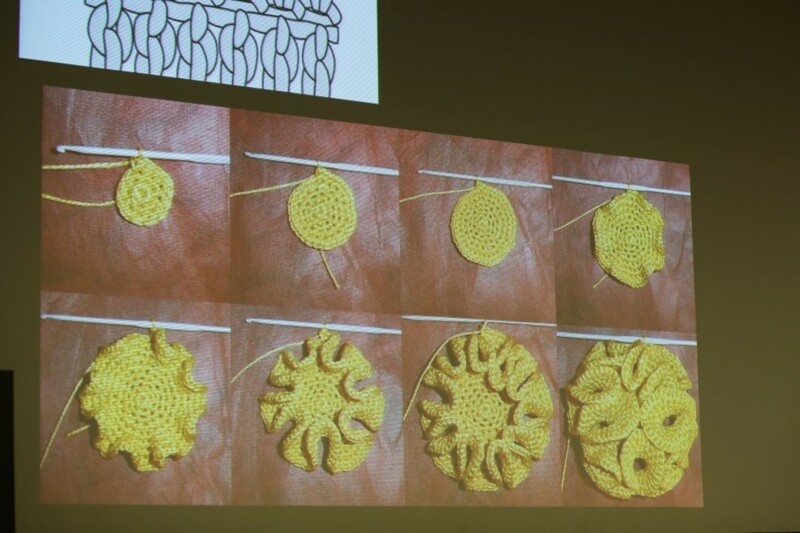 Roosth emphasizes the tight connections between crochet as a craft and biology. We humans, she suggests, imbue biological structure and processes with our own understandings of craft and creation. While the Crochet Coral Reef is based upon principles of hyperbolic geometry and mathematics, crafters working on the project are encouraged to experiment with hyperbolic crochet algorithms, rules and forms. "Natural selection" of the crocheted forms proceeds as crafters preferentially pursue recreating those forms they find most pleasing to create and look at. Roosth's research reveals pervasive biological metaphors and "hyperbole" in the language that reef crafters use to describe their creation of crocheted reef "species." The crafting principles they use, beyond creating structures that imitate biological forms, may help us understand biological evolution. The chaos or chance events that serve as the substrate of natural selection seem to also drive the evolution of our creative pursuits. Slide by S. Roosth. Photo by Paige B. Jarreau.